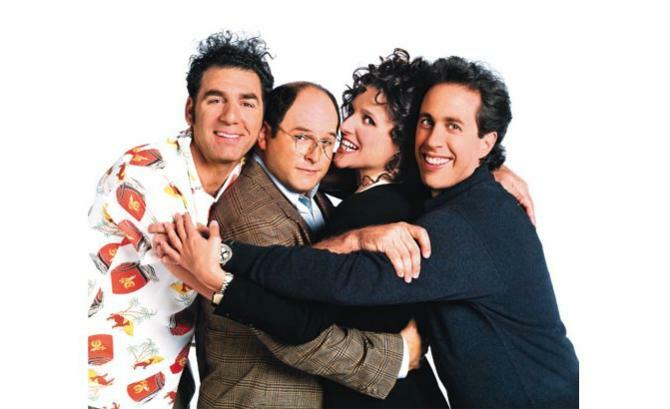 I’m getting ready to go to LA next week to interview a bunch of Seinfeld writers for my upcoming book about the show, and I’m really excited: Interviews with writers are always my favorites. (Hmm, I wonder why.) If you have any specific questions you’d love answered, let me know here in the comments, Facebook, Twitter, or wherever you can find me. For the Seinfeld geeks out there, here are the specific guys (yes, all guys this round) I’ll be talking to: Alec Berg, Tom Cherones, Tom Gammill, Gregg Kavet, David Mandel, Peter Mehlman, Max Pross, Jeff Schaffer, and Fred Stoller. Hey Jennifer! I LOVE this for a book. It’s gonna be a great book! 1. Why no women writers? Was that on purpose? 2. How often did they have to stop filming because someone started laughing too much? 3. How did they come with the material? What percent was Jerry vs. the writers? For real with the women writers! I’ve met only one so far, and I had to TRACK HER DOWN.